James R. Bull, is stepping down as scientific editor of Pure and Applied Chemistry at the end of 2013 after serving faithfully and with distinction since 2002. IUPAC requests nominations and/or applications to succeed Professor Bull in this position. PAC is published monthly and includes recommendations, reports, and lectures from conferences. The mandate for the scientific editor will be to maintain the scientific standards of the journal and specifically focus on the international profile through the publication of collections of invited papers emerging from international events sponsored by IUPAC. Nominations will be accepted from NAOs as well as from individual scientists. In either case, a CV, a brief statement of interest, and an outline of thoughts on the journal should be submitted to the secretary general at <rdeplanque@iupac.org>. If an NAO is making the nomination, a letter of nomination from the NAO should also be included. The deadline for nominations is 31 May 2013. 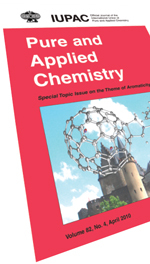 PAC is available online at <www.iupac.org/publications/pac>. Page last modified 14 May 2013.